Hasbro's Generation 3 GI Joe line - originally the 25th Anniversary Collection - did a great job with all those old familiar characters, but they weren't just slaves to the past: they also took the opportunity to introduce new soldiers to the ranks. The motto of the Cobra Bazooka Trooper force is, "Simple gets the job done... with a bang." These basic infantry troopers are given the bare minimum in combat training, handed a rocket launcher and sent into the field to fire at anything that gets between them and their destination. Their rocket-propelled grenades are simple yet effective, capable of blasting through even explosive reactive armor on advanced battle vehicles. They take pride in the simplicity of their weapons and quietly scorn the higher-ranking troopers with their technologically complex systems. Now, sure, like other G3 introductees the Cobra Pilot, Cobra Paratrooper and Cobra Driver, you could make the argument that this is just a tarted-up version of a pre-existing character, but that's not accurate. He may look mostly plain, but he's got a different name and a different filecard. In our book, that makes him new! That said, 97% of this sculpt is shared with the standard Cobra Trooper - normally we'd say "everything below the neck," but even the head is the same this time. This is yet another bald trooper, with nothing to distinguish him from any of the other bald troopers. Well, nothing but the paint. The uniform is a bright blue, with a small red Cobra logo on the chest, and another on the left arm. The bandana over his mouth is also red, further setting him apart from the crowd. The red mask is a feature from the comics - the original toy and the old cartoon both made it black. Why did the comics change it? Well, black's hard to color, which is why costumes typically get highlighted in blue. But since the uniform is blue, a blue mask wouldn't stand out. Thus, whoever was in charge of colors [Nel Yomtov on the first issue, at least. --ed.] went for red, instead. If not for the helmet, this could be a comic-based Trooper. Yes, the helmet - since the figure itself is all old sculpt, it's just the accessories that set it apart. The helmet is entirely new, and really distinctive, thanks to the sculpted netting that covers it. Usually that sort of thing is reserved for snipers who need to blend into the surroundings, but it's not out of place here. 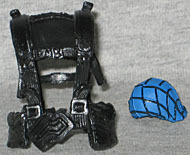 He has new webgear, which is far more detailed than any other, with new straps and buckles, and ammo pouches across the chest. He has the typical Cobra Trooper knife, and a new pistol. There's meant to be a a holster on the back of the belt, but it wasn't glued on at the factory - on any of the Bazooka Troopers. Whoops! Oh, and that name: "Bazooka Trooper?" It's not accurate. He hasn't got a bazooka. He's got an RPG. It's an old-fashioned Russian one, in fact, which makes sense since it's reused from the Crystal Skull Indiana Jones figure. Still, "bazooka" is the generic term for any shoulder-mounted launcher these days, so the terminology isn't too distracting. Just because there was no previous toy called a "Cobra Bazooka Trooper," it doesn't mean there weren't any. You're telling me you never saw a single Cobra with a rocket launcher on his shoulder? Yeah, right. This is a new introduction to the GI Joe mythos, but it feels right at home.